Time Magazine‘s Bryan Walsh reports this week on report and series of maps detailing where climate change and hunger are likely to intersect in future, with possibly devastating results unless the world’s agricultural researchers manage to help small-scale farmers ‘climate-proof’ their crops and livestock in the coming (drying, flooding) decades. 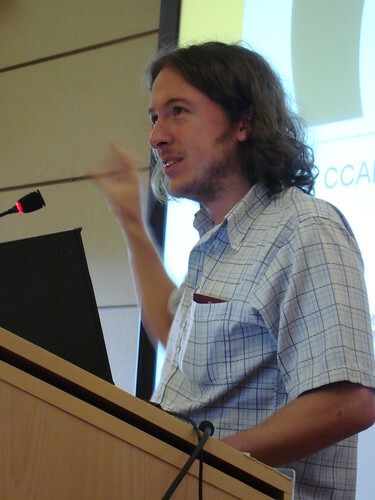 The study was led by scientists at the International Livestock Research Institute (ILRI), based in Nairobi, Kenya, and produced with the Climate Change, Agriculture and Food Security research program of the CGIAR, whose lead centre is the International Center for Tropical Agriculture (CIAT), in Cali, Colombia, where Andy Jarvis, quoted below, works. ‘. . . For parts of the tropics and subtropics, the world in the future could be too warm to farm, with devastating humanitarian consequences for tens of millions of people, many of whom already live in poverty. ‘That’s the conclusion of a scary new study (PDF) from the Climate Change, Agriculture and Food Security (CCAFS) program, a part of the Consultative Group on International Agricultural Research (CGIAR), a global group of food research organizations. The group identified future climate change “hotspots” that are expected to suffer brutally high temperatures during growing seasons in the future, and matched them with areas that were already suffering from food insecurity. The result is a map of suffering for much of Africa and South Asia, and possibly parts of China and Latin America as well. Andy Jarvis, of CIAT and CCAFS, who is quoted in the Time Magazine article, presents an overview of the CGIAR research program ‘Climate Change, Agriculture and Food Security’ at ILRI’s Nairobi headquarters in May 2011 (photo credit: ILRI/MacMillan). ‘”When you start to hit 30 C your crops start suffering, and that’s going to happen here,” says Andy Jarvis, a fellow with the International Center for Tropical Agriculture, another subgroup of CGIAR. . . .
‘The maps and the reports are a reminder of one of the inescapable facts of global warming politics: those who are least responsible for the problem, those who are already living close to the edge, are those who will almost certainly suffer the most. “It’s just a perfect storm,” Jarvis says. “The food is going to have to come from somewhere.” . . .
Read the full article at Time Magazine: Tropical hotspots face food woes in a warmer world, 3 June 2011. Tags: Andy Jarvis, CIAT, Time Magazine. Bookmark the permalink.